Dirty rice is as deep in taste as it is in history and heritage. Brace yourself for this flavor explosion. 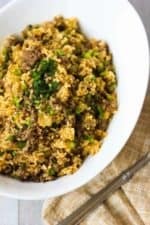 This Authentic Cajun Dirty Rice recipe will transport you down to New Orleans with one bite. Kickin’ good! This is easy to make and it’s the real deal. Just enough heat to make it really nice. This dish is just so delicious and comforting. We love the simple ingredients that go into Dirty Rice. 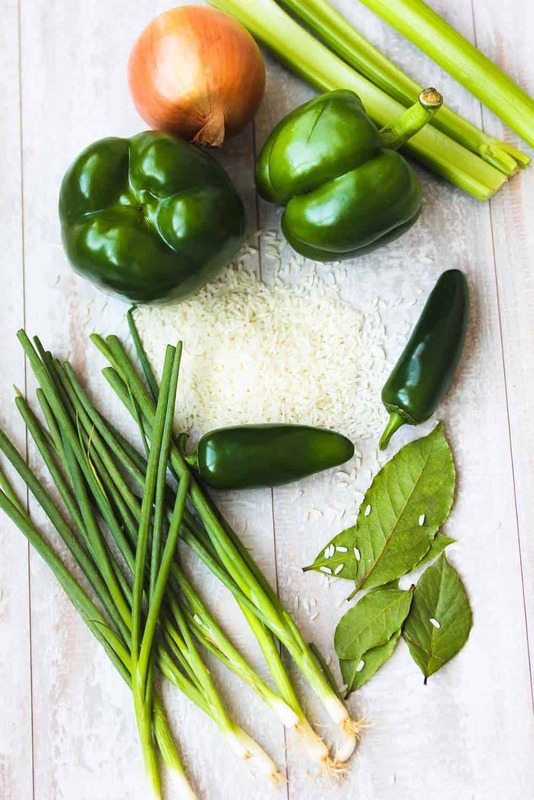 You can never go wrong with green bell pepper, jalapeno, garlic, onion, bay leaves and lots of good Cajun spices. 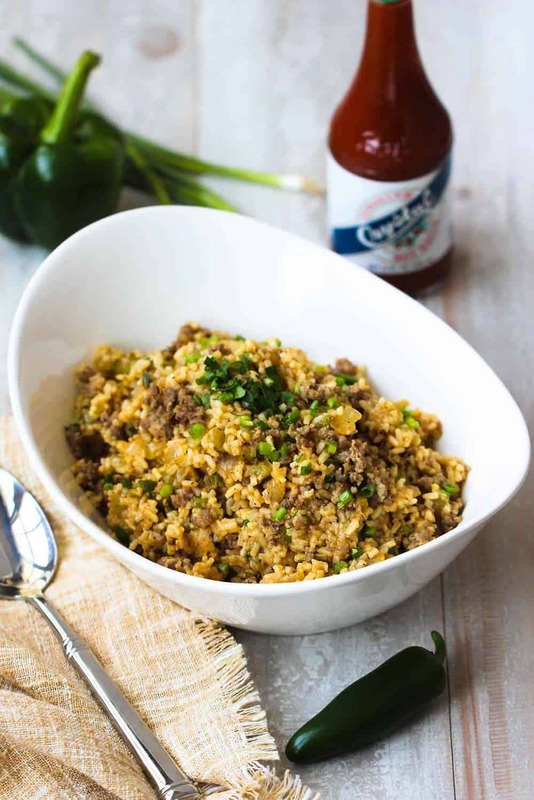 Watch us show you how easy (and fun) it is to make this amazing Cajun Dirty Rice! We love making this dish as authentic as possible, and pureed chicken livers may sound unappetizing, but they really are not a pronounced flavor at all, and actually, deepen the taste to a rich, but wonderful dish. Also, make sure you steam your rice perfectly and don’t let it get too dried out. 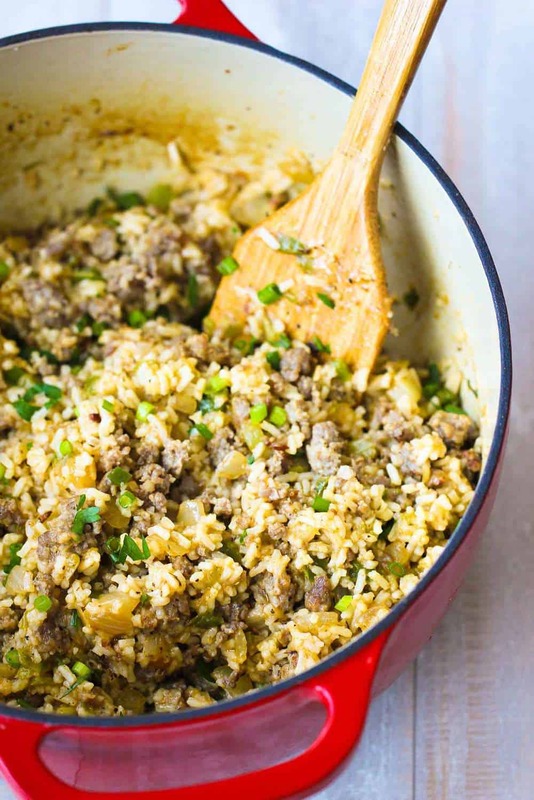 Then all the other ingredients blend together to make an amazing Cajun Authentic Dirty Rice! The jalapeños and cayenne pepper add some heat, too, so if you prefer, you can pull back the to fit your taste preferences. Or, on the other end of the heat perspective, you can add more of the flavor enhancers to increase it’s kick! This dish is also beautiful in presentation! And serve it with you favorite hot sauce, such as Crystals, Louisiana or Tabasco! Dirty Rice has a long, challenging history, and comes from a dark place in the Unites State’s history. But it is steeped in tradition and has found its place in culinary excellence. Now, let’s make this Authentic Cajun Dirty Rice recipe! This recipe comes from famed New Orleans chef Donald Link. It is the real deal. In a large skillet, heat the oil over high heat. Once hot, add the pork and chicken livers and cook, stirring, until browned. Add salt, pepper, and chili powder and stir often, but not constantly: The idea is to get the meat to stick to the pan and get a little crusty. Add 1/4 cup of the chicken stock and simmer until it has evaporated, allowing the meat mixture to get browned and crusty and stick to the pan once again. Add the onion, celery, garlic, jalapeño, and oregano and cook, stirring, until the veggies are nicely browned and crusty and beginning to stick to the pan. Add the rice (recipe below), the remaining 1 1/4 cups broth, the scallions, and parsley. Stir until the liquid is absorbed and the rice I heated through. Combine the rice, water, bay leaves, and salt in a medium pan and bring to a boil over medium-high heat. Reduce the heat to low, cover with a tight-fitting lid, and simmer for 15 to 20 minutes. Remove from the heat, and keep covered for an additional 5 minutes. Remove the lid, cool for a few minutes, and then fluff the rice with a fork. both of them VERY soon! Made this last night with prawns and kielbasa, because that’s what I had on hand. The best dirty rice recipe I’ve tried so far. It was also a big hit with my southern husband. Thanks again! That’s great to hear, Jessi!! 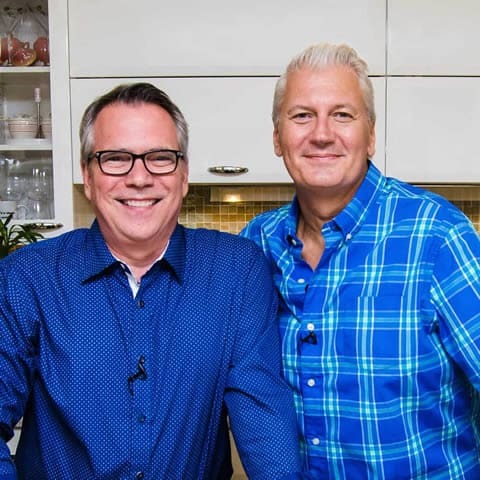 That’s definitely one of our all-time recipes and so glad you and your hubby liked it! Thanks for letting us know!! Stay in touch!